11/11/16 7:16 PM at Murray, Ky.
Technical fouls: Illinois State-None. Murray State-None. How can you open a basketball season with anything better than a buzzer beater for the win at home? the Illinois State Redbirds at the CFSB Center in Murray, Ky.
Stark's winner came after the Racers had fought back from a 62-58 hole with 2:38 to go. Tuesday when they take on Middle Tennessee in Murfreesboro. two each from Terrell Miller, Jr. and Bryce Jones to take a 46-42 lead with 13:42 left. 11/15/16 6:35 p.m. at Murfreesboro, Tenn.
Technical fouls: Murray State-None. Middle Tennessee-None. Technical fouls: Green Bay-None. Murray State-None. Technical fouls: Murray State-None. UMKC-Clark, Duane. Technical fouls: Murray State-None. Bowling Green-None. 11/26/16 7:00 PM at Murray, Ky.
Technical fouls: Alabama A&M-None. Murray State-None. 12/03/16 7:00 PM at Murray, Ky.
Technical fouls: Detroit Mercy-Williams,Jarod. Murray State-None. 12/10/16 3 p.m. at Ford Center, Evansville, Ind. Technical fouls: Murray State-None. Evansville-None. Technical fouls: Bethel (TN)-None. Murray State-None. Technical fouls: Murray State-None. Ole Miss-None. Technical fouls: Murray State-None. South Dakota State-None. Technical fouls: Wright State-None. Murray State-None. Technical fouls: Brescia-None. Murray State-None. Technical fouls: Tennessee State-Martin,Wayne; Reed,Jordan; McCall,Tahjere. Technical fouls: Murray State-None. Jacksonville State-None. Technical fouls: Murray State-None. Tennessee Tech-None. Technical fouls: Murray State-None. Eastern Illinois-DAMA, Muusa. Technical fouls: Murray State-None. SIUE-None. Technical fouls: Eastern Kentucky-None. Murray State-None. Technical fouls: Murray State-None. Austin Peay-None. Technical fouls: Southeast Missouri State-None. Murray State-None. Technical fouls: UT Martin-None. Murray State-None. Technical fouls: Belmont-None. 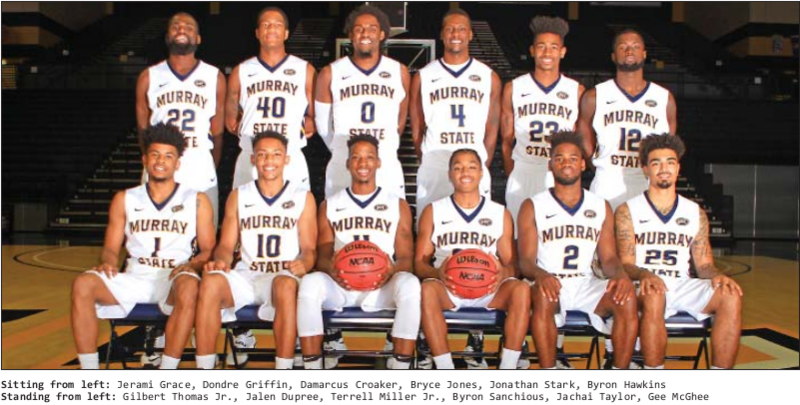 Murray State-TEAM. Technical fouls: Murray State-TEAM. Morehead State-None. Technical fouls: Austin Peay-None. Murray State-None. Technical fouls: SIUE-None. Murray State-TEAM. Technical fouls: Eastern Illinois-None. Murray State-None. 02/23/17 6:30 p.m. at Show Me Center -- Cape Girardeau, Mo. 02/25/17 6:10 p.m. at Elam Center - Martin, Tenn.
Officials: James Hicks, Coy Gammon, Ford Branch, Jr.
Technical fouls: Murray State-Thomas,Gilbert. UT Martin-None. Technical fouls: Murray State-None. Morehead State-None. Technical fouls: Murray State-None. UT Martin-None.